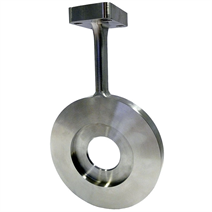 Compact orifice plates can be used without difficulty for the measurement of liquids, gases and vapours. Compact orifice plates enable the simple assembly of the measuring arrangement as a plug-and-play solution, through which significant cost savings can be achieved. Differential pressure transmitters and valve manifolds are attached via compact pressure tappings. These measuring arrangements have the advantage that differential pressure lines can be eliminated. The compact orifice plates are offered as standard in two beta ratios. In the case of customer-specific requirements for the beta ratio, our software simplifies the design and selection process.